China Eastern Airlines use Terminal 3 at Xi’an Airport. This is the newest terminal, and provides a spacious and comfortable facility. Check in for China Eastern Premium customers has a separate area with carpet and armchairs. Staff on duty at 6.30am check in were efficient at retrieving the booking, although English language skills were limited to “aisle or window”, and customer service was not high on his agenda at this time of day. Security had very long queues for Economy class, but the priority lane for First and Business class was quicker, requiring a 5 minute wait. The China Eastern VIP lounge is typical Chinese domestic standard – a lines of chairs, a small self serve counter for beverages and nothing to eat. Staff service is geared totally for Chinese customers and it is difficult to have any conversation of make enquires about boarding time, so it is best to simply watch the FIDS inside the lounge. The boarding commenced 25 minutes before scheduled departure, and a Sky Priority lane provides quick access for First/Business class passengers to board. The general boarding service appeared to be conducted quite quickly and efficiently. Cabin staff provided a courteous welcome, and hot towel was offered once seated. Reading material was limited to local Chinese newspapers, and the English language Global Times and China Daily. As with most domestic flights, the Flight Deck do not offer any welcome or flight information before departure, and silence rules. This 3hrs 15 mins flight was on one of China Eastern Airlines newer A321 aircraft, the Business class cabin of 12 seats was 90% full, with 2 staff serving this section. Chin Eastern business class domestic customers receive a checked bag allowance up to 30kg, and 1 piece of hand luggage up to 10kg. 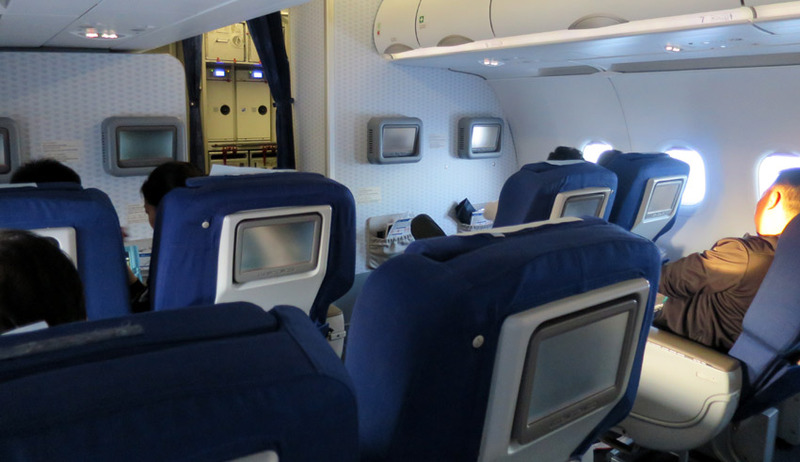 This A321 aircraft had 3 rows of business class seats, configured 2×2. Seat pitch is good for domestic trips up to about 3 hours. The seat recline is generous, with a comfortable and adjustable headrest. An adjustable footrest on the seat in front provides reasonable comfort. There is a single toilet at the front of the aircraft for this business class cabin. This was clean on inspection, but no amenities other than paper towels and tissues are provided. The flight departed on time, and arrival into Sanya was 15 minutes ahead of time. Scheduled flight time was 3hrs 15mins. Cabin staff offer customers a choice of a Chinese or Western breakfast. There is no menu so it is guesswork as to what each meal type may provide. Selecting the Western option, this is served as a single shot meal tray containing: bowl of cornflakes with milk pre-poured, plate of cut fruit, a cold croissant, main course of omelette served with bacon, cauliflower on a piece of soggy bread. 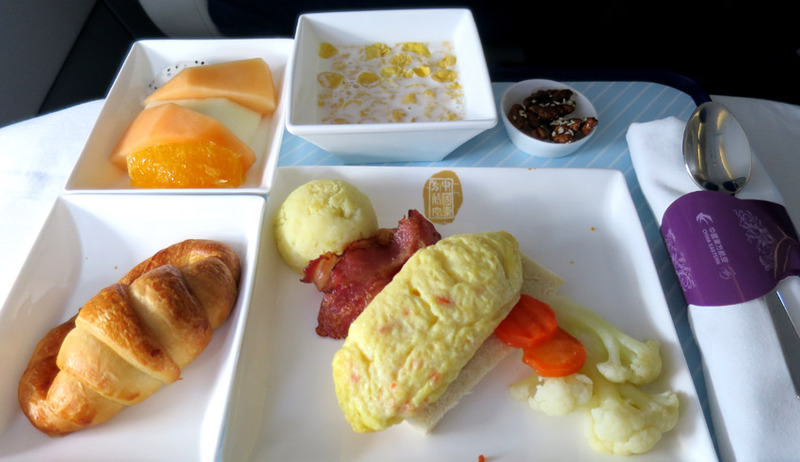 Considering the increased number of foreign travellers using China Eastern domestic flights, one imagines their catering department could research food standards better, with the flavour and standard of this main course being nothing better than terrible. Insufficiently heated, the omelette was clearly made from dried or reconstituted eggs, and accompanying vegetables were similarly poor. Visually the croissant appeared okay, but again taste was poor. It is worth noting that having spent 2 days at the Regal Airport hotel in Xi’an Airport where western breakfasts were excellent, China Eastern catering fail to look at local resources to raise their standards. 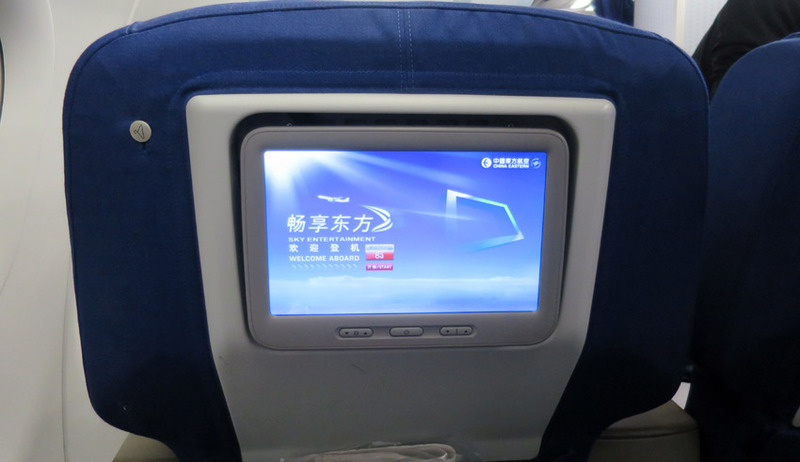 This A321 was fitted with China Eastern Airlines latest Sky Entertainment. A good sized seatback PTV screen provided a good choice of on demand Audio and Video programming, including movies and TV series, this providing a welcome surprise for this domestic trip. A pillow is provided on the seat at boarding, and staff also served a small blanket to business class customers. Cotton hot/cold towels were served several times during the flight. There were 2 cabin staff in this premium cabin. Whilst their English language skills were limited, they were both very courteous and cheerful, and service was supplied with a smile, and this appeared to be genuine. They were quick to help stow hand luggage, hang jacket etc, and the inflight meal service was conducted quickly and quite efficiently. Overall a good standard of service that could not be faulted for this type of domestic flight. Arrival into the very sunny blue skies of Sanya was very welcome after days of severe smog and pollution in Xi’an, and the flight landed about 15 minutes ahead of schedule. From arrival airbridge to the baggage hall is a pleasant semi-shaded open air walk, and bags were delivered to the carousel some 10 minutes later. 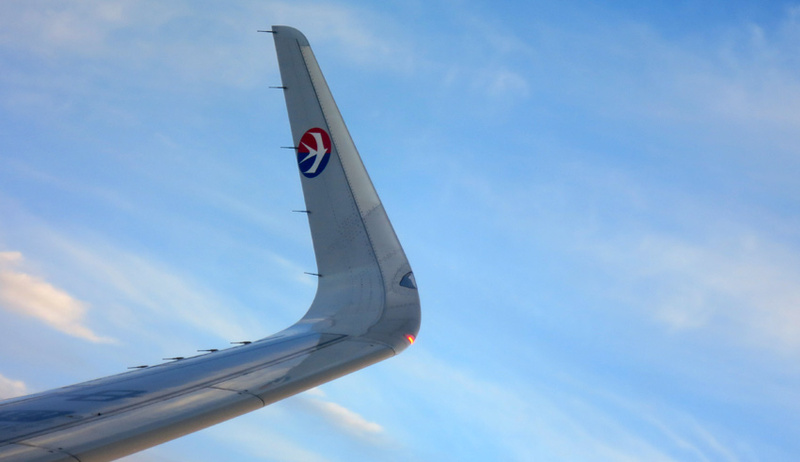 Compared to recent domestic trip experiences in China this was a good flight, assisted by the fact this was one of the newer China Eastern Airlines aircraft (some of their older planes used on domestic have uncomfortable seats and cabins can be dated and tatty). Staff service onboard the flight was good, less so in the airport environment where focus is totally on efficiency and speed, and lacks other aspects of customer service.